Sorry…Some technical difficulties on train this morning. 2.Tech Going Parabolic…Jumps 26% Since the End of 2016. 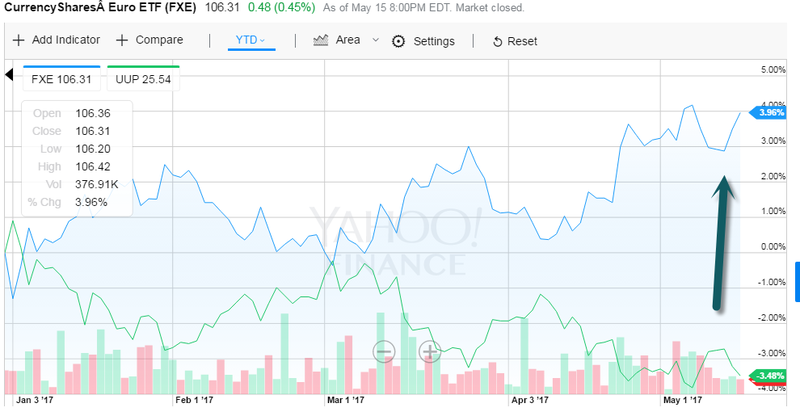 3.Even High End Retailers Feeling the Online Pressure….Nordstrom Misses. 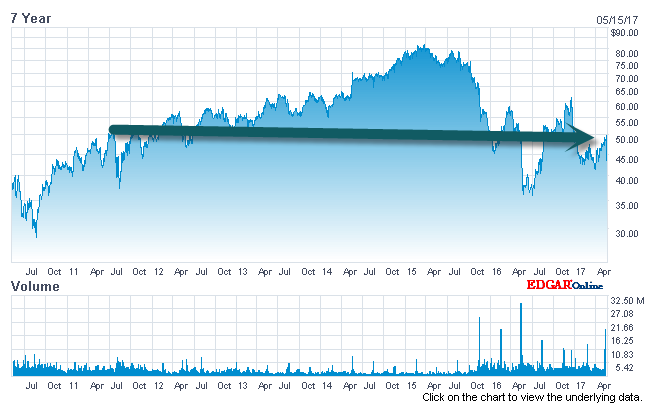 Nordstrom Trading at 2011 Levels….7 Year Itch. 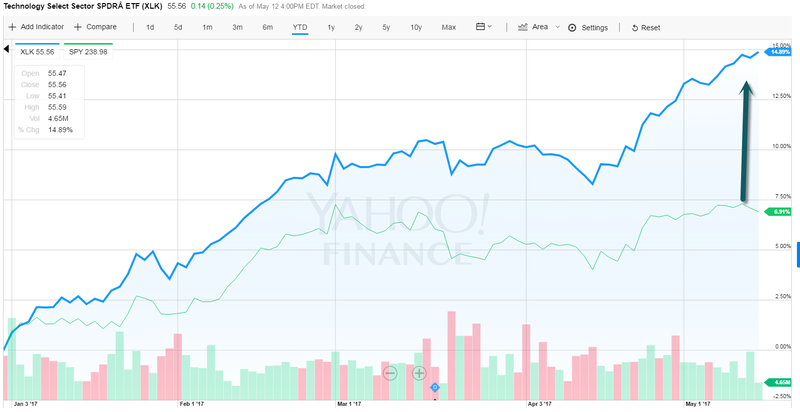 4.Speaking of Tech and Retail….I came into the business right at AMZN IPO time. As you may have already seen, Amazon.com (AMZN) marked the 20th anniversary of its IPO today, and what a ride it has been. We’ve all seen the stats, but put simply, from its split-adjusted closing price of $1.958 on 5/15/1997, AMZN has rallied more than 48,800%. Yes, you read that correctly, 48,800%! In other words, a mere $100 invested in AMZN after its first day of trading would now be worth just under $49,000 today! 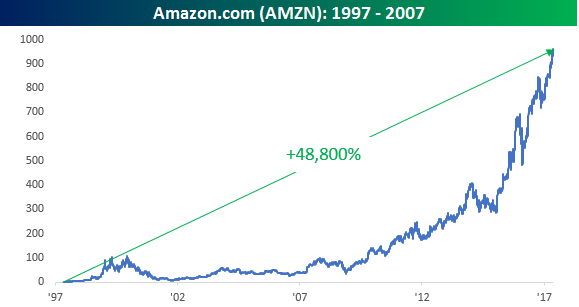 In retrospect, just buying and holding AMZN twenty years ago was a no-brainer, but for the twenty years that it has been trading, the hardest thing for most investors was probably not to sell. The chart below shows historical drawdowns from all-time highs for AMZN going back over the last 20 years. As you can see, the ride up for AMZN has been anything but smooth. While it may seem like AMZN does nothing but go up these days, it’s had plenty of rough patches. 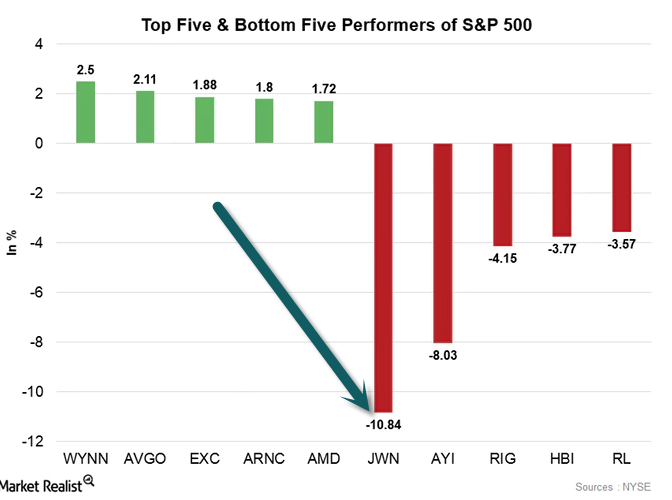 In fact, for a seven-year stretch from the Spring of 2000 to the Spring of 2007, AMZN was consistently more than 50% below its prior all-time high, and at one point it was down 95%. 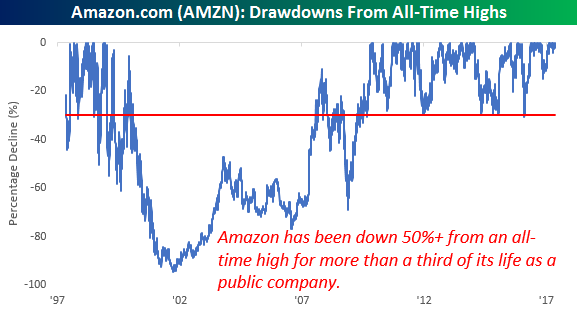 When you look back at the entirety of its life as a public company, AMZN has actually been at least 50% below its all-time high more than 36% of the time! 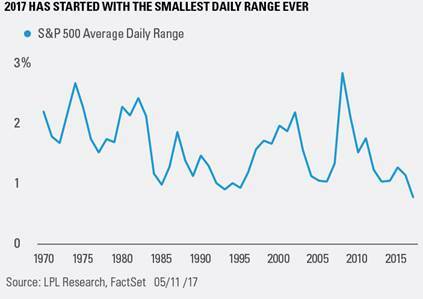 Even as recently as last March, the stock was down over 30% from an all-time high in what was the eighth such 30% drawdown (red line) since it came public. Based on today’s price, that would be equivalent to a decline of $289/share. These kinds of drawdowns look easy in retrospect, but they’re extremely hard to stomach in real time. A lot of investors in AMZN now would have a hard time swallowing a decline of that magnitude today. Would you? 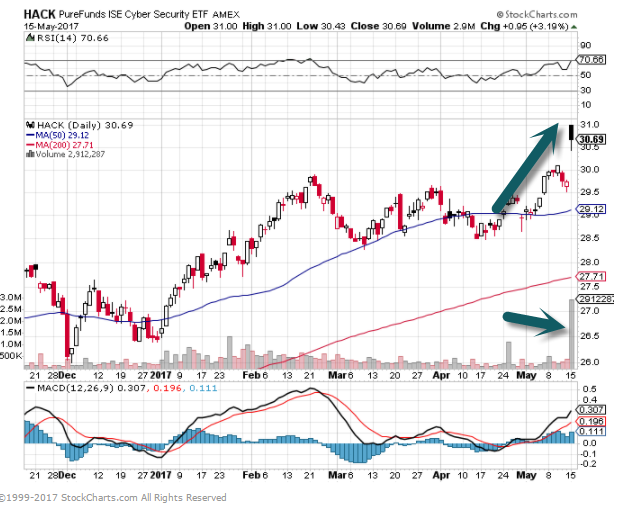 5.HACK Cybersecurity ETF…No Shock Spike on Huge Volume. 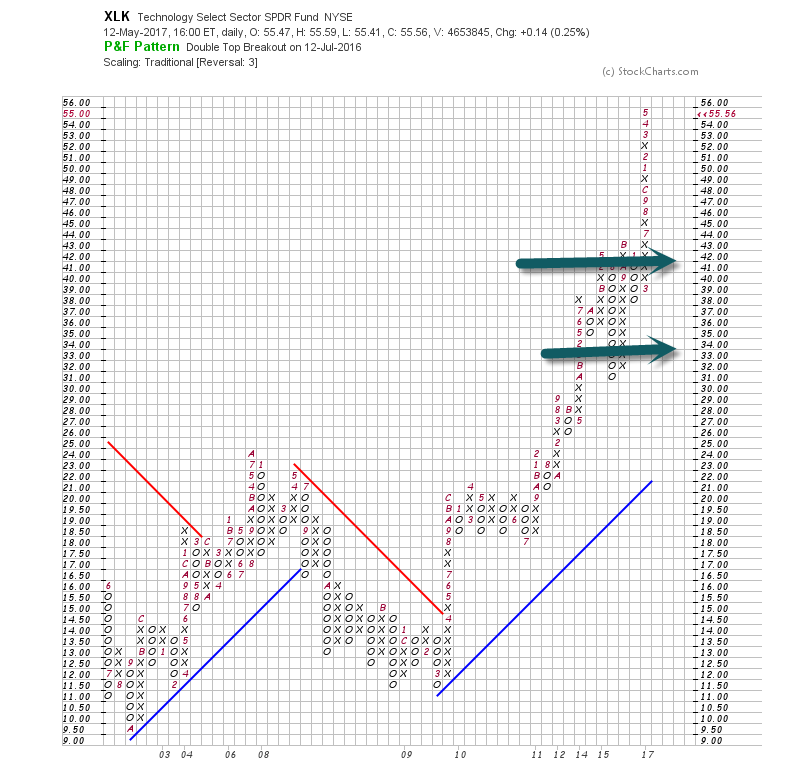 HACK Pure Funds ETF-See Volume Bars. 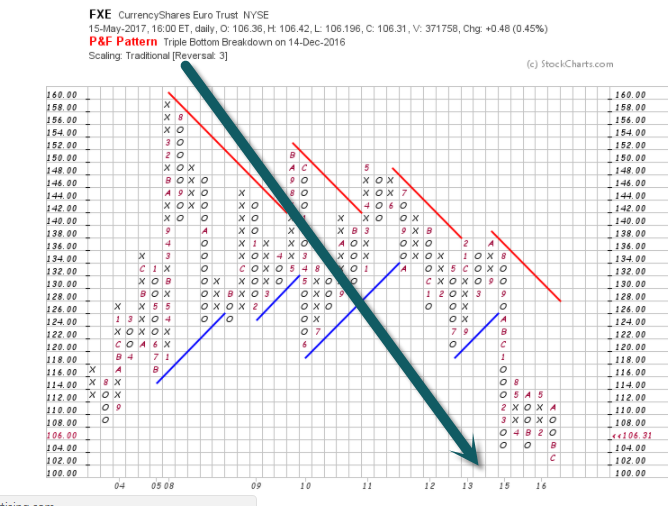 Long-Term Picture Euro still 35% Off Highs….New all-time lows to start the year. 7.More on Our Continuing Coverages of Wages and Wealth. The Census Bureau updates its income figures about once a year, and the last real update we had was last fall (taking us through 2015). Doug Short did an analysis of those numbers. He breaks the country into quintiles, calculates the average household income for each quintile, and then also shows the top 5%. 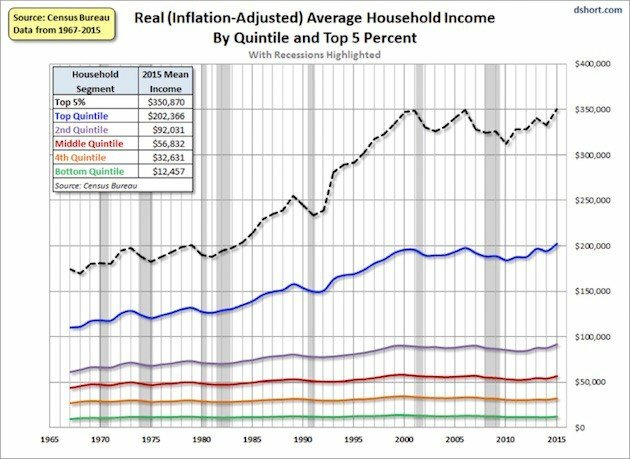 Notice that the average income for the top 5% is $350,000. What we see now is that there has been almost no movement for the bottom 60%. 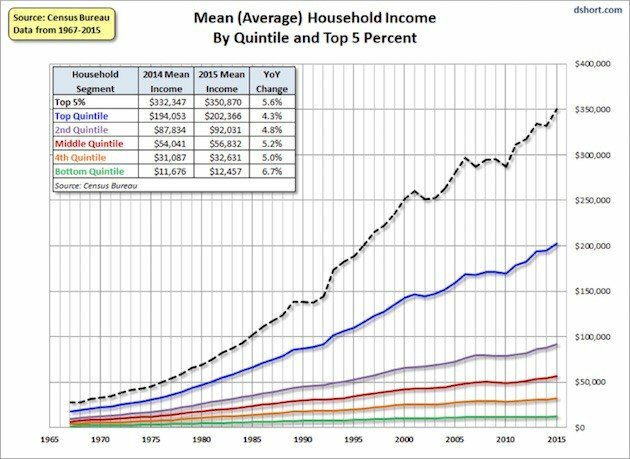 The middle quintile has grown somewhat, and—this won’t surprise anyone—the top 20% and 5% have done very well. 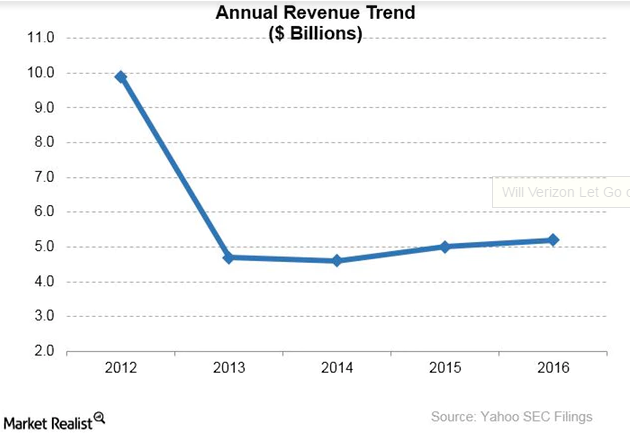 8.Yahoo Revenue Under New Leadership. Even a looming scandal wouldn’t deter some of Congress’ most eager stock traders. Rep. Tom Price (R-Ga.), President Donald Trump’s nominee to be Health and Human Services secretary, was under siege, the harsh lights of a Senate hearing upon him. News reports showed he had bought shares in a tiny biotechnology company while sitting on committees that could influence the firm’s prospects. A colleague, Rep. Chris Collins (R-N.Y.), had tipped him off to the investment. But what many saw as a scandal, others saw as an opportunity. On the very day that Wyden was decrying Price’s bad judgment, Rep. Doug Lamborn, Republican of Colorado, bought shares of the same tiny Australian company, Innate Immunotherapeutics. Within two days three more members also bought in — Republicans Billy Long of Missouri, Mike Conaway of Texas and John Culberson of Texas. 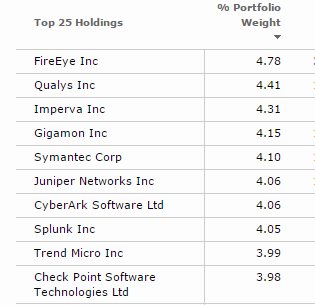 Conaway added more shares the following week. These brazen decisions to gobble up shares of a little-known firm at the very moment when such trading was being decried as an abuse of power reflects Congress’ anything-goes culture around stock investments. In the pursuit of wealth, even obvious conflicts of interest are routinely ignored by members who feast on daily trades. Long, for instance, serves on a committee overseeing Obamacare, and Conaway is a deputy House whip. The health care lawmakers who invested in Innate Immunotherapeutics are hardly alone in trading in companies that have a major interest in federal legislation, according to a three-month investigation and examination of all stock trades by members of Congress. POLITICO found that 28 House members and six senators each traded more than 100 stocks in the past two years, placing them in the potential cross hairs of a conflict of interest on a regular basis. And a handful of lawmakers, some of them frequent traders and some not, disproportionately trade in companies that also have an interest in their work on Capitol Hill. Read full story Found at Josh Brown’s Reformed Broker. You’ll need it. By the year 2020, expect emotional intelligence to be one of the top 10 job skills. Last year, the World Economic Forum released its fascinating Future of Jobs Report, looking at the employment, skills, and work force strategy we should expect by 2020, as the Fourth Industrial Revolution goes into full swing. But here’s where it gets interesting: With the roles of advanced robotics, artificial intelligence, and machine learning increasing, chief human resources officers from global companies were asked what they see as the top 10 job skills required for workers to thrive by 2020. 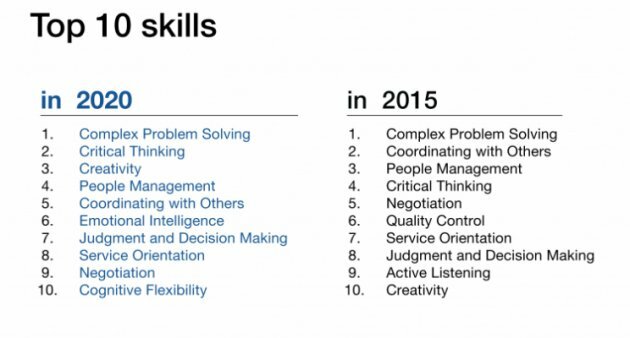 As you can see in the comparisons below, we will experience some notable shifts between skills required in 2015 versus 2020. Creativity, for example, will become an even more valuable skill to have, jumping from No. 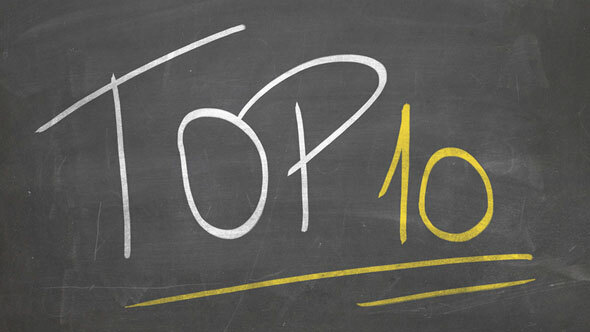 10 to No. 3 on the list. With new technologies forcing new ways of working, employees will need to become more creative to keep up with the changes. Two newcomers on the 2020 list will be critical skills to have. One of them is cognitive flexibility. It makes sense, as superior customer service will demand agility, and be on-demand, personalized, and conversational. But did you notice the other new skill appearing in 2020 that wasn’t even around in 2015? Like cognitive flexibility, in the Fourth Industrial Revolution, emotional intelligence (E.I.) demands that before you hastily dash into technological problem-solving, you pause to contemplate and explore the real needs of people from a human-centric angle. 71 percent valued emotional intelligence in an employee over IQ. 75 percent said they were more likely to promote a high E.I. worker. 59 percent claimed they would not hire someone with a high IQ if they had low E.I. Companies are placing a high value on E.I. in new hires for several reasons that lead to competitive advantage. People with high E.I. understand and cooperate with others, they are exceptional listeners, are open to feedback, have more empathy, and make thoughtful and thorough decisions, says Deutschendorf. How Do You Actually Practice Emotional Intelligence? In my search to answer that question in a practical manner applicable to almost everyone, I referred to my go-to source on all things E.I. Enter Six Seconds. They are the foremost emotional intelligence resource on the internet, and the world’s largest network of emotional intelligence practitioners and researchers. They also aspire to a very ambitious goal: one billion people practicing the skills of emotional intelligence by 2039. In a recent blog by Six Seconds CEO Joshua Freedman, he asked the company’s worldwide network of certified practitioners this question: How would you recommend that people practice E.I.to be more intentional and less volatile? Here are some of the best responses I found, edited for length. 1. Nehad Tadros: Pause. Acknowledge your thoughts and feelings. Clear your mind. Acknowledging your emotions brings together the cognitive and the emotional, which research has shown to be a powerful way to lessen the intensity of an emotional reaction. After pausing and acknowledging, your mind will already feel much clearer. When you feel compressed, breathing deeply into the belly can release muscles. Really breathe, and let your shoulders open and relax. As you fill up with air, the physiological expansion influences the mind and emotions as well, reducing stress and increasing openness. This helps us make more powerful, positive choices. 3. Sandeep Kelkar: Ask yourself the three questions of optimism. Then step back and become a detective and try to gather evidence for those views. If those thoughts are inaccurate, dispute them and choose realistic, accurate, positive thoughts. 4. Dawn Cook: Focus on what you can influence. When you hit a setback, separate the parts of the situation you can control or influence from the parts you cannot. Focus on what you can influence, and notice how much more confident you feel about overcoming the setback. 5. Niloufer Aga: Take a six-second pause. When you are frustrated or upset, before you say something harsh, take a six-second pause to quickly assess the costs and benefits of that action. When you apply consequential thinking, you make more careful choices that ultimately work to your advantage. 6. Joshua Freedman: Find something impossible to do and practice. It sounds corny, but it’s a profound mental switch. Just try saying, “I can’t,” and then “I can’t yet” — the emotional experience is dramatically different. The first is a wall. The second, a door. 7. Carolyn Meacher: Tap into compassion everywhere. Engage in positive caring dialogue with the taxi driver, the dry-cleaning man, the grocery-bag packer, etc. Say good morning to passing people on the sidewalk. Ask meaningful questions. Really listen to the answers. 8. Beth Hammett: Take two. Set aside two minutes–relax and breathe deeply. Then write down two solutions to your problem. 9. Dexter Valles: Share what you feel. Create opportunities to informally share what you feel and ask for feelings feedback–in your teams as well as with clients. This can clear the air of any harbored darkness in the relationship.